Edson Machinery supply a range of analogue and digital Schmidt wire tension meters to monitor tension during winding. This ensures a uniform resistance when winding using single or several spindles.This also reduces wire breaks and maintains repeatability of wound components. Edson Machinery supply perspex cylinders complete with felt press unit to ensure correct de-reeling of copper wire and ensuring pre-tension to the winding machine removing the possibility of the wire looping onto itself causing a "kink" and possible reject coil. 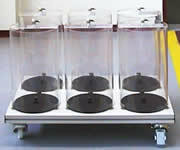 Our range covers all Din reel sizes. IWT produce the AEU/E II, a unit for stacking cores between 13 and 90mm in height. Complete stacking cycles take only seconds. Change of lamination height or core height takes only three minutes. Different models are available offering different stack height ranges and lamination configurations. A cost effective way of laminating volume transformers. They also produce the AEU/I, a similar machine to the AEU/E but designed for stacking cores between 0 and 90mm in height. Edson Machinery design and supply winding mandrels and tools for bench mounted and multi-spindle machines. All winding tools are supplied either with or without balancing depending on the bobbin diameter and winding speed required.